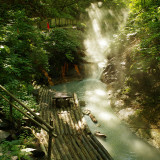 When you think of Japanese cuisine, sushi is perhaps the first food that springs to mind. 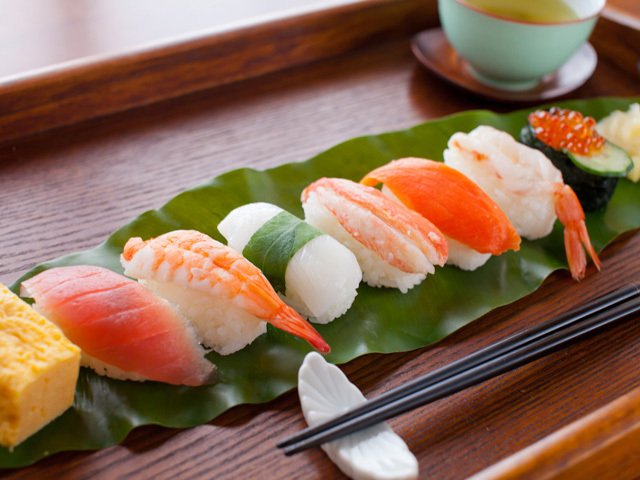 Generally sushi consists of raw fish served on a small block of rice. 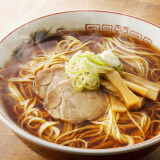 There are many kinds of sushi and people vary a great deal in their liking for this Japanese classic. For plenty of foreign visitors to Japan, eating delicious fresh sushi carefully prepared by a qualified chef, is a great opportunity to get a real taste of Japan. But what kinds of sushi are most popular in Japan? 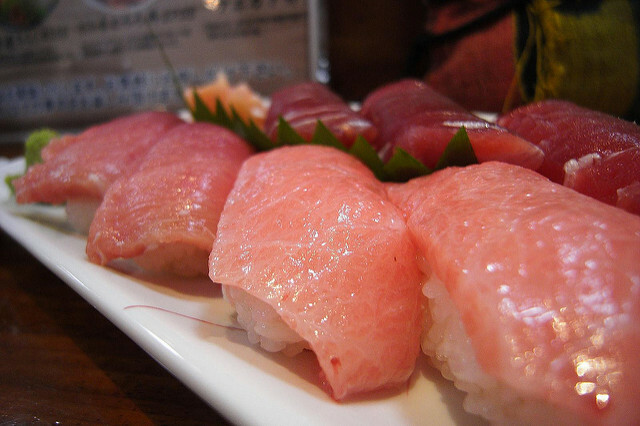 Tuna (‘maguro’) is the most popular kind of sushi among Japanese people. Though not all tuna sushi is equal, and the kind of tuna depends on gender and location. In general, medium fat tuna is the most popular sushi in the nation, but men may be more likely to order fatty tuna. In colder areas such as Hokkaido, it tends to be more common to order fatty tuna rather than medium fat tuna. Red tuna is also very popular. Among women, salmon tends to be the most popular kind of sushi. 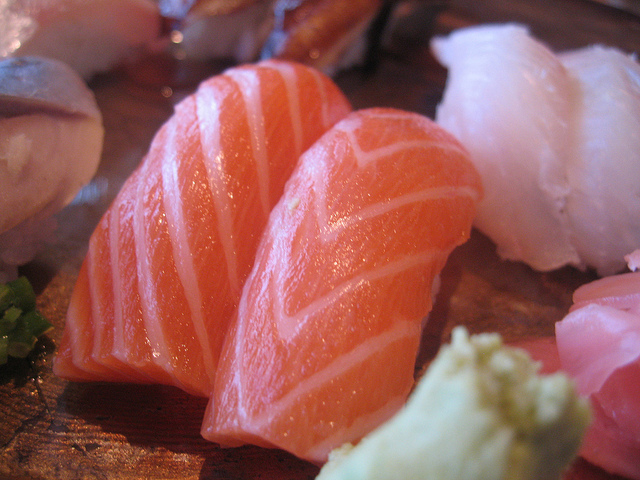 Over the last decade onion topped salmon with mayonnaise and optional wasabi, has become a staple of sushi restaurants. Salmon tends to be lighter on the stomach than tuna and certainly less fatty on average. 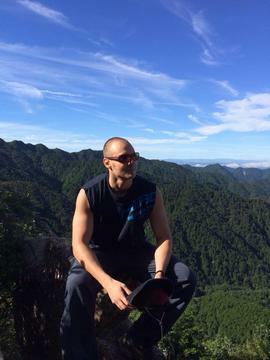 This explains why it is more popular with Japanese women. 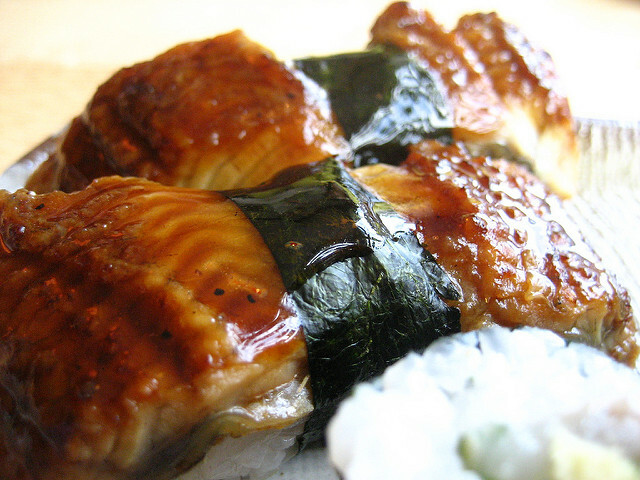 Unagi is a freshwater eel and often served smoked, with many shops specialising in unagi rice bowls. When prepared for sushi, unagi is broiled with a sweet sauce. People then tend to add sweet sauce rather than soy sauce at their tables. Unagi, while delicious, is a distinctive flavour – while very popular, there are many Japanese who don’t eat much unagi sushi. Although overall unagi is considered a revitalising food and is especially popular when Japanese people start to feel tired from the heat of summer. Unagi shouldn’t be confused with another kind of eel, anago, which is sea water eel. 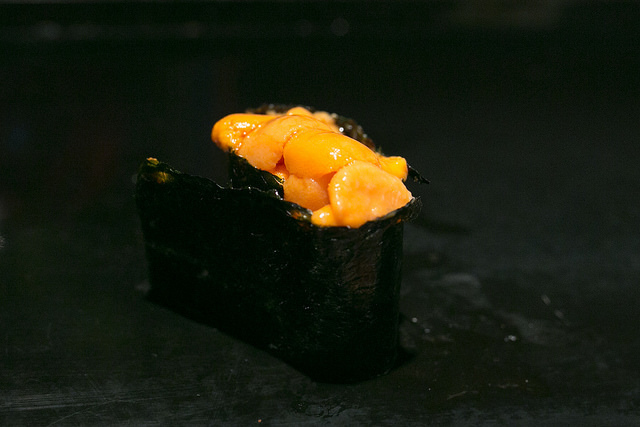 Uni is sea urchin and is the most popular kind of sushi in Kyushu. Kyushu benefits from a large amount of fresh sea urchin, so the locals can enjoy some of the best available in the country. The edible part of the sea urchin is sometimes believed to be ‘eggs’ which gives the wrong idea – it is actually the urchin’s gonads. This may go some way to explaining why this golden coloured creamy delicacy is an acquired taste. If you eat uni in front of Japanese people, they might be shocked since they are normally under the misconception that foreigners can’t each much sushi, especially such exotic varieties. Be aware that uni tends to be rather expensive. Ikura has a couple of meanings in Japanese, one is ‘salmon roe’ and another is ‘how much?’ leading to the joke about the foreign guy who couldn’t get out of the sushi restaurant – every time he asked how much he owed, he received more salmon roe. Ikura is served on top of rice, wrapped in nori seaweed which keeps the little eggs from escaping as you lift your sushi to your mouth. 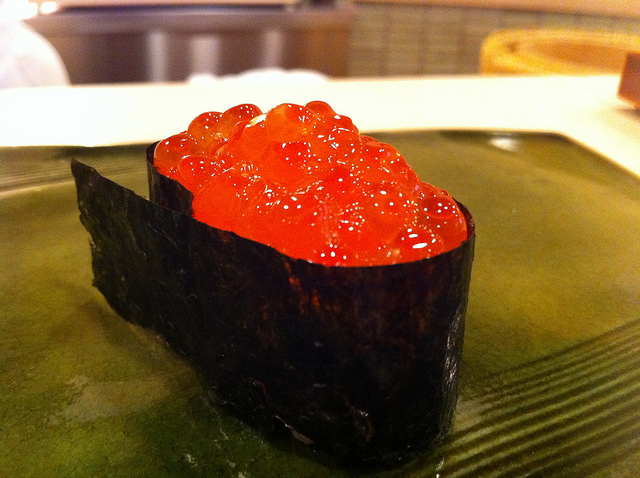 It is commonly served with a small piece of cucumber, especially in 100 yen sushi shops – which regulates the space available for the more expensive salmon roe. This is another sushi with a distinctive flavour and while very popular, it’s not for everyone. 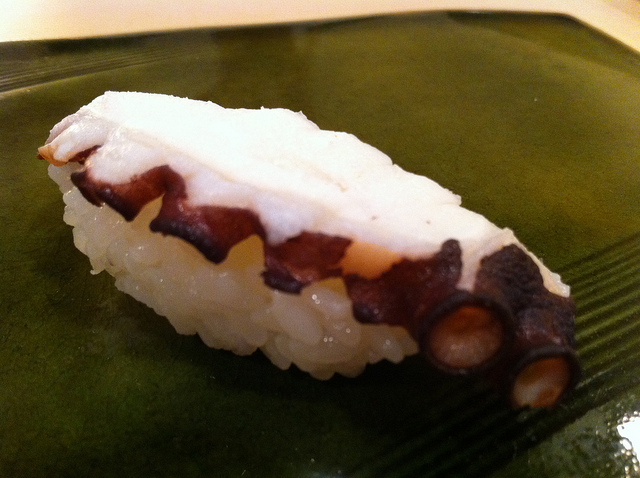 Octopus, or ‘tako’ is also served in Japan as sushi. You’ll see it in every sushi restaurant. Most people quite like it, but with a milder flavour it doesn’t have as many fans as some of the other sushi on this list. Octopus would likely be more popular if it were easier to eat. Since raw octopus is rather chewy, eating much of it becomes hard work on the jaw. This would explain why tako sushi is reasonably popular, whereas ‘takoyaki’ grilled octopus balls (with small pieces of octopus inside) is a very popular Japanese food. Hamachi is a popular sushi, especially in the south of the Chugoku region where it is one of the most popular kinds of sushi. 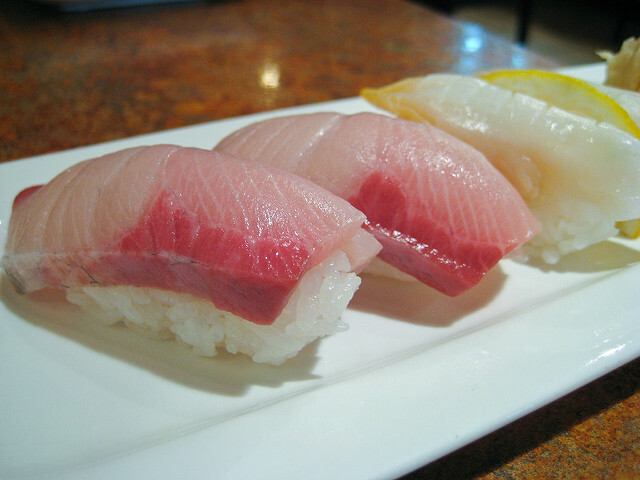 Hamachi is Japanese amberjack, or yellowtail, and can be quite oily. 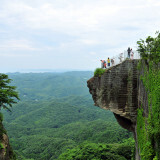 It has a mild flavour and is very easy to eat several pieces of. Now time to go and sit at a sushi bar and watch the chef preparing those pieces of sushi in front of you, or go to the ‘kaiten’ sushi bar and watch the sushi come around on a little conveyor belt. Just remember that Japanese horseradish, ‘wasabi’, might be included with some sushi, while other times you’ll need to request it if you want it – so it’s best to check first.